Orchard Road is known as the heart of shopping in the city of Singapore. From fast-fashion multinational clothing brands to exclusive high-fashion luxury names, the vibrant and bustling neighbourhood that stretches as far as the eye can see is filled to the brim with retail stores to satisfy every shopaholic’s dream. However, what’s lesser known even among shoppers is that it’s also home to one of the best sports bars in Singapore. In the midst of shopping on weekend nights, you may wish to take a break and sip on a cold cocktail to be refreshed, but sadly, all the good bars are quite a distance away in the Clarke Quay area. Well, you’re in for a treat when you head to K Bowling Club in [email protected]! Read on to know more about this amazing sports bar. 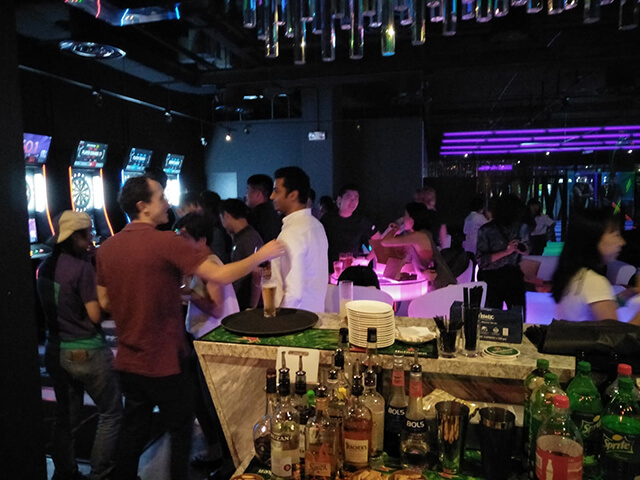 A multi-entertainment venue located in the heart of the shopping district, it’s the premier destination in Singapore if you’re looking for a well-stocked and diverse selection of drinks with a touch of bowling and arcade fun! K-Bowling Club is more than just a bar – it’s has bowling alleys, an arcade, darts, karaoke booths, and it even turns into a bona fide club when the sun sets! Boasting a bar that rivals any of the popular ones in Singapore, indulge in casual favourites like Heineken, tasty cocktails, and Pierre Jean Merlot or sip on the luxurious and exclusive classics like Macallan 12 years or Johnnie Walker Blue Label. Additionally, wine lovers can enjoy wines like Michel Lynch Sauvignon and also Makgeolli, which is a Korean Rice Wine. Of course, if you’re looking for thirst-quenchers, then they also have non-alcoholic drinks such as mocktails, soft drinks, and also fruit juices. Need a pick-me-up? The bar also serves coffees and a range of teas for your caffeine kick. Take a break from the heat and rehydrate on a selection of teas like Chamomile, Earl Grey, English Breakfast, and Rose & Peppermint. Experience a unique bowling experience at K Bowling Club that’s out of this world! With the first full-time cosmic bowling alley in Singapore, strike the pins while being accompanied with flashing space lights and heart-thumping music from the hottest music artists currently! Want to enjoy a challenging and fun activity with friends? K Bowling Club also has Dart Machines set up near the bar so you can test your accuracy over a round of drinks. What’s even better? The loser of the game has to buy a round of beer for everyone! Which Singaporean doesn’t love singing their hearts out to their favourite songs in a karaoke session? At K Bowling Club, they have all the tunes you need, from oldies of decades past to the trendiest latest hits. We reckon you’re tempted to head to K Bowling Club now, right? Be it with family in the daytime or with friends when the sun sets, it has every entertainment activity that you could want for hours of fun, which is why it’s one of the best sports bars in Orchard, Singapore.